It is replaced by the Datamax-O'Neil I-4208. 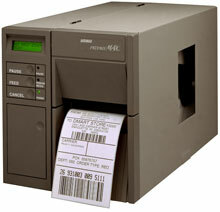 For demanding barcode labeling applications requiring the ultimate in versatility and performance. The Prodigy MAX is YOUR printer. Datamax makes each Prodigy MAX printer to order. Choose the features you need and Datamax will custom-configure and ship your printer within a matter of days. Moreover, your Prodigy MAX printer can grow with you. If your application changes and/or develops, you can modify your printer. Many of the printer's options can be installed in the field. Every Prodigy MAX printer features a high powered 32-bit microprocessor to give you more labels in less time -- up to 10 ips. Additionally, the Prodigy MAX printer has a rugged steel cabinet that shields the printer and media, ensuring continuous quality operation, even in the most demanding environments. All units ship with product documentation. Thermal transfer, 300 dpi, 10 ips, 4.1" print width, parallel & serial interfaces, 512KB DRAM, 1MB EPROM. Includes internal rewind & US power cord. Order cables separately. See accessories. Thermal transfer, 300 dpi, 10 ips, 4.1" print width, parallel & serial interfaces, 512KB DRAM, 1MB EPROM. Includes US power cord. Order cables separately. See accessories. Thermal transfer, 203 dpi, 10 ips, 4.1" print width, parallel & serial interfaces, 512KB DRAM, 1MB EPROM. Includes internal rewind & US power cord. Order cables separately. See accessories. Thermal transfer, 203 dpi, 10 ips, 4.1" print width, parallel & serial interfaces, 512KB DRAM, 1MB EPROM. Includes US power cord. Order cables separately. See accessories. Direct thermal, 203 dpi, 10 ips, 4.1" print width, serial interface, 512KB DRAM, 1MB EPROM. Includes internal rewind & US power cord. Order cables separately. See accessories. Direct thermal, 203 dpi, 10 ips, 4.1" print width, serial interface, 512KB DRAM, 1MB EPROM. Includes internal rewind, peel & present & US power cord. Order cables separately. See accessories. Thermal transfer, 300 dpi, 10 ips, 4.1" print width, serial interface, 512KB DRAM, 1MB EPROM. Includes internal rewind, LCD display, & US power cord. Order cables separately. See accessories. Thermal transfer, 203 dpi, 10 ips, 4.1" print width, parallel interface, 512KB DRAM, 1MB EPROM. Includes internal rewind, LCD display & US power cord. Order cables separately. See accessories. Thermal transfer, 203 dpi, 10 ips, 4.1" print width, parallel interface, 512KB DRAM, 1MB EPROM. Includes LCD display & US power cord. Order cables separately. See accessories. Replacement printhead mount assembly, 300 dpi. Replacement Printhead Kit, 203 dpi. Compatible to part number 220039.